Orbiter Web Forum A forum for general Orbiter-related comments and discussion. Post your questions about Orbiter and addons in the appropriate forums below. Upload your Orbiter screen shots to our gallery HERE! 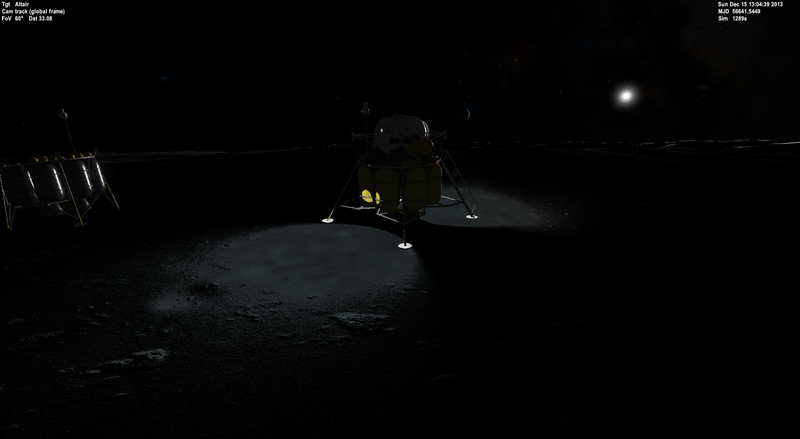 Constellation now has spotlights to land on the polar regions. 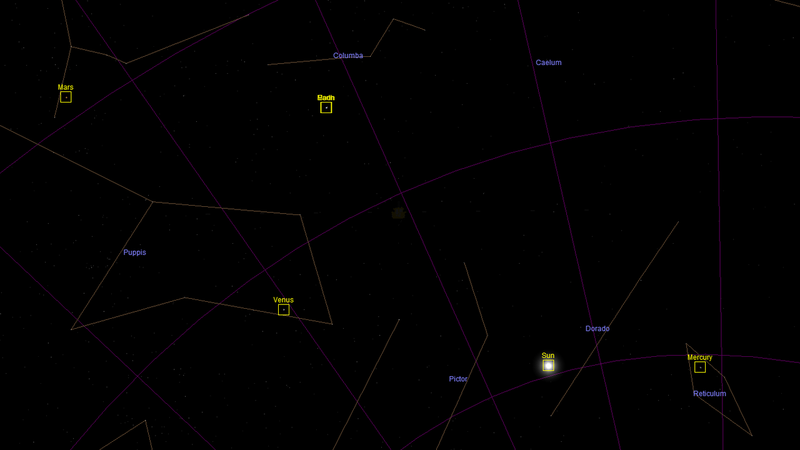 I put Ulysses into polar orbit around the Sun and got a nice portrait looking down at the 4 inner planets. I ended up approaching Jupiter from its south pole and it sent me going over the Sun's north pole first and then looping around to the solar south pole, I believe that the real Ulysses actually did the opposite if I'm not mistaken. Sadly the radiators seem to show the reflection map with the closed payload pay doors. Yes. Too bad reflections can't act like shadows, and not go through the mesh. This is due to how the D3D9Client handles environmental reflections. All reflective surfaces share one environment camera per vessel that generates the actual reflections. And it is completely static. Currently the environmental camera for SSU is set up in the center of the payload bay so that is what will be reflected in the reflective surfaces of the orbiter. This should really change to a system where each reflection map generates its own camera. I don't think a reasonable number (8?) would hurt the frame rates that bad, even on maximum settings. It would be enough if the reflection map just represents the current state of the mesh = gets recomputed. But I would guess it takes a moment to calculate. The reflections should get updated every 2nd - 6th frame depending on settings. In the Wolf's screen shot it's likely the payload that is being reflected. And the reflection camera is likely in the front of the payload. To work better, the camera should be attached to payload-bay doors. One on both sides and they should move along the doors themselves. Improper camera location can cause all sort of anomalies. What DaveS said could help to reduce the problem. But the main issues is that how to attach the cameras into the right locations. (i.e. how to communicate all the information to the client). I am working on some optimizations to the shadows and after that I'll look into the reflection issues. Last edited by jarmonik; 06-06-2018 at 06:58 PM. To work better, the camera should be attached to payload-bay doors. On the Debug Controls, the user selects a mesh group and attaches a custom reflection camera to it. Looks good. I like the status panel below the MFDs. Will the the custom keys be visible ? Some add-ons do this on the default view. It helps a lot! the "Control Panel" is my first attempt at using the VC functions for clickable buttons, etc. I expect the layout will change quite a bit once I get my head around how the button and area-redraw stuff works. Hopefully most of the useful functions will be "clickable" and have some kind of status indication. I may well re-model the panel mesh, once I have a better idea of what I can do with it. When reading the novel 'Titan' by Brandon Q. Morris (german language) I tried to recreate a Titan-landing scenario, using the MAV lander with the super-sonic decelerator. Landing is easy. The atmosphere is so dense that the vessel is very slow after the atmospheric entry. But below the clouds the Titan surface is white, untextured. The texture addons on Orbithangar are for Orbiter 2010 or earlier, and it is not included in the MinorBodies texture pack. Would there be an easy way to promote textures to the 2016 format? The Titan hi-res textures have been updated. Last edited by francisdrake; 08-06-2018 at 07:39 PM. Reason: Textures have been updated. I just had a look and realised that Titan indeed doesn't seem to have been converted to 2016 texture format. For some reason I was sure that Titan was using the new format already. It's odd that your surface is untextured, since the old-style texture (Textures/Titan.tex) should still be present and working. I'll check this out tonight. Does anybody know of better sources? Maybe it is not untextured white. It looks like a white, polygonal ground patch. An orange texture is visible in the distance. This white patch seems to follow the vessel around on Titan's surface. Thanks for looking into this!